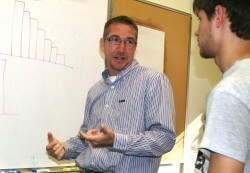 GAINESVILLE, Fla.—Supported by a $2 million grant from the National Science Foundation, University of Florida math education researcher Tim Jacobbe is leading a multi-center effort to create high-quality testing instruments in statistics, which will help teachers keep middle and high school students on track for meeting rigorous, new national math standards. With 45 states, including Florida, already adopting new Common Core national math standards developed in 2010, many school districts are expected to add or expand the teaching of statistics in the middle and high school grades. Researchers, though, say more reliable assessment tools are needed to measure their progress accurately. 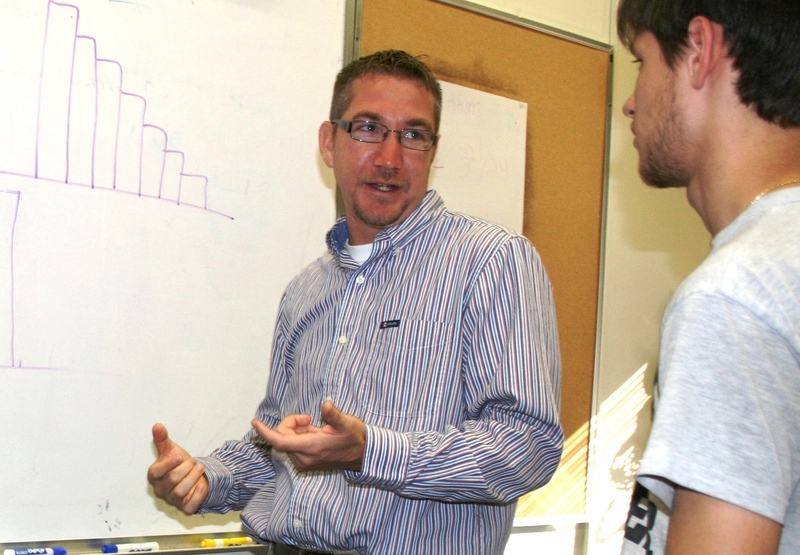 UF's Tim Jacobbe, lead investigator for the NSF multi-center study, explains a statistics principle to a UF math education student. Besides UF’s College of Education, the four-year study also involves scholars in statistics and assessment from the University of Minnesota, Kenyon College and the Educational Testing Service, an independent, nonprofit organization based in Princeton, N.J. The Common Core State Standards are a blueprint for what all American students should learn in English and math, in each grade, from kindergarten through high school. They were coordinated in 2010 by the National Governors Association and a national council of chief state school officers for K-12 education. Florida schools are scheduled to start using the new standards by the 2013-2014 school year. “Statistical thinking is very different from mathematical thinking and needs to be taught and assessed in a different manner,” Jacobbe said. Current statistical instruction and assessment are grade level-specific, but Jacobbe said his research team is following a model identifying the three levels of understanding of key statistical concepts, regardless of a student’s grade level. About 2,850 students in grades 6-12 will participate in the UF-led study. Two school districts, in Florida and Georgia, will administer initial pilot-testing of the experimental assessment methods. (The Florida school district is P.K. Yonge Developmental Research School, UF’s K-12 laboratory school, which serves as its own school district). They will be joined by school districts in Arizona, New Jersey, Ohio and Pennsylvania for large-scale testing in the study’s fourth year. The researchers will work closely with two national consortia of state leaders in government, business and education which last year received a combined $330 million in federal Race to the Top funds to create the next generation of tests to measure annual student growth in English and math. The two groups are the 25-state Partnership for Assessment of Readiness of College and Careers, known as PARCC, which includes Florida, and the 31-state SMARTER Balanced Assessment Consortium. To broaden the impact of their work, Jacobbe said his team will report its study results in peer-review journals and at peer-review academic meetings and will create a website featuring sample assessment tools and other resources for teaching statistics. “Consistent standards in statistics and mathematics will provide appropriate benchmarks for all students regardless of where they live, and that’s critical in today’s global economy,” Jacobbe said.